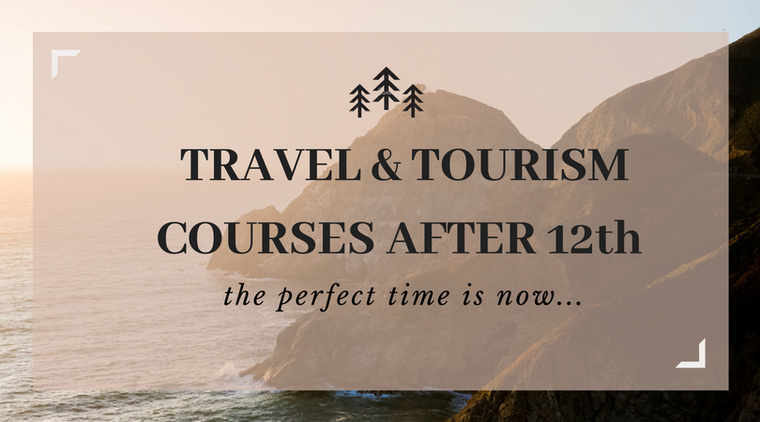 Travel and Tourism Courses After 12th - Find Your Right Career Here. Through this article, here we are going to provide career counseling guidance for the students who wish to pursue their career after 12th from any stream Science, Commerce or Arts and with these, we are also providing details about some good job- oriented professional travel and tourism courses in Pune after 12th. So if you are not ready with your career decision, then you might need to hustle because a lot of emotion is attached to that decision you will going to take. If you failed to choose one for you then your parents will ask suggestion about your career to the relatives or neighbors. Unfortunately, they will decide what you will become when you grow up. To save yourself from all this, we came up with some of the best career opportunity after 12th. Here’s the list of courses as per your subject stream, so you can understand your interests and get an idea what to choose from it. Commerce has versatile career prospect and various courses, and so are the endless courses which you can pursue after your 12th class. The commerce field is associated with accounting and financial planning, it is very crucial for any business. A short term or long term course can prepare you for the career in finance, banking, and management. A student who passed 12th class generally prefers himself for the medical exams. But apart from preparing for medical colleges, there are many other courses which are being quite popular in the last decade. Here are some medical and science courses for 12th pass students. After passing the board examination, most of the students Especially from (PCM) group prefers engineering degree and pursue the most common branches of engineering, but we have listed some unknown branches of engineer which might interests you. It’s observed that the students of art stream are directly related to the professional courses. But nowadays, The art stream is directly related to creativity, being creative means you need to find your hidden talents. Most of the time you knew them but one thinks it does not have any scope so ignore it. This art is the most amazing field incorporates with painting, designing, photography, travel and tourism and mass communication. RM. – stands for Bachelor of Retail Management. El.Ed. – Bachelor of Elementary Education. P.Ed. – Bachelor of Physical Education. El.Ed. – Diploma in Elementary Education. Nowadays, the situation is not much different for the parents. It’s difficult for them to decide what’s best for their kids. It is ruthless to decide someone's career without even understanding one’s interests. Too many choices are not always good, especially when it comes to picking the right career option. Choosing the right career depends upon your interest and passion. Because the secret of success is directly proportional to the work you love and the work you enjoy doing. It's always wise to choose what you love doing. Let’s take an example of travel and tourism - the fastest growing industry in the world. We have tragic situation in the Indian job market, the automation is taking over and swallowing thousands of jobs every year. In this whole scenario, one needs to be very careful about choosing the right career for yourself or your kids. “Travel & Tourism generated 25,394,500 jobs directly in 2016 (5.8% of total employment) and this is forecast to grow by 2.1% in 2017 to 25,925,500 (5.8% of total employment). This includes employment by hotels, travel agents, airlines and other passenger transportation services (excluding commuter services). It also includes, for example, the activities of the restaurant and leisure industries directly supported by tourists. So, if you are passionate about traveling and love to travel you can think to choose travel and tourism industry as a career. Here we are providing some of the best career opportunities in travel and tourism industry in which you can enroll after 12th. Travel management and tourism management courses are divided into two parts short-term courses and long-term courses. Here is the list of Travel & Tourism courses after 12th , you just have a look! This short-term course will give you the insight of travel and tourism in very short time and then you can opt any graduation to upgrade or you can simply work in the same field. The International Air Transport Association (IATA) is the trade association for world’s airlines. If one wants to learn about how to provide the best flight, accommodation. These Travel management and tourism management courses attract thousands of aspirants every year. These courses are one of the best ways to seek opportunities in travel and tourism in very less span of time. However, one must have realistic expectations about the outcomes. By pursuing one of these short-term courses, you surely get into travel and tourism industry. These tourism courses are offered by many travel and tourism institutes. But If you are looking to enroll in the above travel and tourism courses in Pune. You can think about Travind Institute of Travel and Tourism Management In Pune the only institute in Pune recognized by ITT UK offers multiple short terms courses to get one’s specialized in travel and tourism domain, providing quality education on job training and study tours. Travind completes the industry’s requirements of highly skilled professionals. Click here for more details on short-term courses by Travind. Hope this article helps you to make a decision about your right career choice. Choosing a right career or college is bit stressful and this put students in dilemma, Don’t worry about it as it's the common scenario with every high school passed student. Get the help of experts career counselors! Free Career Guidance. Our dedicated career counselors are always available to help you.